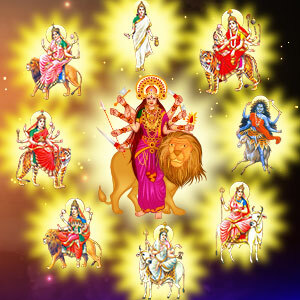 Ghatasthapana Puja Vidhi entails installation of the Kalash and invocation of Goddess Shakti for nine days. The first and foremost thing to do is preparing the Ghata or Kalash. Take the clay pot in order to sow the seeds of seven grains. Put a layer of soil in it and then spread some seeds. Afterward, put another layer of soil and spread seeds around the periphery of the pot. Now, put the final layer of the soil and spread it evenly. Spray some water if required. Next, take the Kalash and tie the moli (sacred thread) around it. Fill it with sacred water up to the brim. Put betel nuts, durva grass, coins, Akshat, and scent into the water and then put 5 leaves on the edge of the Kalash. Cover it with a lid. Wrap the coconut inside the red cloth and tie the two with a sacred thread. Put the coconut on top of the Kalash. Keep the Kalash at the center of the wide pot in which grains are sowed. Now, the Kalash is ready for invocation of Goddess Durga. Pray to Goddess Durga and request her to accept your prayers and reside in the Kalash for nine days. Afterward, perform Panchopachar puja. It is done using five items. Light an earthen lamp or diya in front of the deities. Light incense or dhoop sticks and then offer flowers to the Kalash. Finally, offer sweets and fruits (Naivedya) to the Kalash to conclude the Puja.